What’s wrong with the dames in this town? When they aren’t powdering and painting their faces, they’re at petting parties, drinking in blind pigs, or dancing the night away doing the black bottom or the kinkajou. Now it seems that they are also morphing into gun molls. According to police, several female stick-up artists are currently menacing Los Angeles residents, and at least two of them are red-heads. 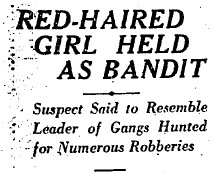 With so many women bandits prowling the streets and preying on the unwary, competition for the title of Robber Queen is fierce…the most recent contender for the crown is Patricia Sullivan, aged 23. Miss Sullivan and a male companion were taken into custody by Officers Reid and Garner in front of her apartment building at Tenth and Western. Patricia was transported to the county jail where she was booked on suspicion of robbery. Her accomplice has been identified as 27 year old shoe salesman, Alvarado Contreras, of 1132 West Thirty-First Street. The two have avowed their innocence but Miss Sullivan closely resembles the description of the lady crook given to police, from her toes right up to her auburn tresses. Detective Lieutenant Smith and Captain Kallmeyer of Wilshire Division are arranging for the victims of Her Royal Heistness to come to down to the station to positively identify her as the woman who terrorized them. Patricia’s reign as Robber Queen was short-lived…she was only Queen for a Day.